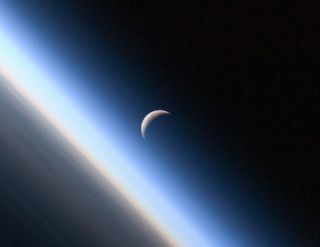 A setting, waning crescent moon amid the thin line of Earth's atmosphere. MOFFETT FIELD, Calif. — While the annual Draconid meteor shower peaked Saturday (Oct. 8), the moon stole the night sky show for some amateur astronomers over the weekend. The Draconids "shooting star" display was drowned out by sunlight in the Western Hemisphere and by a nearly full moon in the East. But rather than curse Earth's nearest neighbor for spoiling the Draconids' fireworks, people around the world celebrated it Saturday during the second annual International Observe the Moon Night. The Ames event, one of hundreds planned worldwide, was a big hit with skywatchers young and old. "I like looking at the moon," said 8-year-old Charlotte Versavel of nearby Palo Alto. "I like seeing the craters." International Observe the Moon Night is a fledgling annual event organized by scientists and educators from government agencies, non-profit organizations and businesses around the world. NASA centers are well represented among its participants. This year, Ames, Goddard Space Flight Center in Greenbelt, Md., and Marshall Space Flight Center in Huntsville, Ala., all hosted events. The goal is to generate interest and enthusiasm in the moon, and to teach the public about Earth's natural satellite, organizers said. To this end, the Ames event let ordinary folks try their hand at remotely driving a rover in NASA's lunar simulant test bed. Scientists also gave lectures about robotic lunar exploration, the recent discovery of what look to be vast stores of water on the moon and NASA's LADEE (Lunar Atmosphere and Dust Environment Explorer) mission, which is due to launch in 2013. "It's a good night to be looking up," said LADEE education and public outreach lead Brian Day, who helped organize the Ames activities. "The moon is in fact a really exciting place." People here seemed to agree with Day. Kids raced from one telescope to the next, chattering with excitement as the moon's complex, battered surface came into clear and close-up view. Last year, there were 502 International Observe the Moon Night events spread across 53 countries, according to organizers. The numbers should be comparable this year, Day said. While no Draconids were seen streaking through the skies here Saturday night, the moon was not the only heavenly body to draw oohs and aahs from the crowd. Amateur astronomers' telescopes are trained on the moon at NASA's Ames Research Center during International Observe the Moon Night on Oct. 8, 2011. Amateur astronomers shifted their focus throughout the night, training their telescopes on binary stars, planetary nebulas and the planets Uranus and Jupiter. While Uranus appeared as a pale greenish-blue dot in the scopes, some of Jupiter's reddish cloud bands were visible, as were several of the giant planet's moons. Many of the attendees at Ames were schoolkids, and some of them were getting their first good look at the moon and these other celestial objects. But the night belonged to everyone, the young at heart as well as the young. "I'm very much into this," said software engineer and amateur astronomer Ayad Qumei, from Santa Clara, who set his telescope up on the Ames lawn. "We are all kids when we look up there."